RSW Estates is estate coffee from three small family-owned coffee plantations who have partnered to create a very special, and limited production, Jamaica Blue Mountain coffee. The coffees are processed at Sherwood Coffee Works, which has been processing coffee since the late 1700’s, but now is dedicated exclusively to the RSW Estates Blue Mountain coffees. The three estates are Resource Coffee Farm, Sherwood Forest, and Whitfield Hall. Tasting notes: Tends to the floral side, with a note of citrus and significant sweetness. Superbly balanced, just the right acidity; it is a smooth and delicious coffee. Available in Medium Roast only. 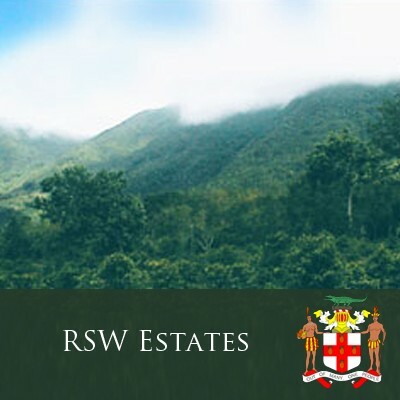 RSW Estates is a partnership of three small family-owned coffee plantations that produce a Jamaica Blue Mountain coffee of superb characteristics and very limited supply. In addition, this coffee is ultra-rare in the United States as most of the RSW Estates coffee is exported to Europe. The three farms, Resource Coffee Farm, Sherwood Forest, and Whitfield Hall have been growing Jamaican Blue Mountain coffee since the late 18th century. All the coffee is processed at Sherwood Coffee Works, which processes exclusively for this select coffee partnership. These three estates are located across the Yallah’s River from Mavis Bank, high in the Blue Mountains. Resource Coffee Farm, owned by Mr. Cecil Langford for over 40 years and run by his son Gordon, has 40 acres of coffee trees under cultivation. It is located just below the 100 year-old Cinchona Botanical Gardens. Sherwood Forest is one of the original Blue Mountain coffee plantations and, of the few that remain intact, it is one of the largest. Its coffee trees are planted in the prime areas of the farm’s tree-shaded valleys, and planting also include a 100-acre site at 4,400 feet above the sea called “The Big Level”. This gentle slope, high in the Jamaica Blue Mountains, produces Sherwood’s highest quality coffee. Whitfield Hall, the “W” in RSW Estates is located high in the mountains and was founded in 1776. While at one time most of the Whitfield Hall’s 300 acres were under coffee cultivation, coffee is grown on 40 select acres. Whitfield Hall has also been lodging visitors in the old Great House for over 100 years, many of whom stop while hiking to the top of Blue Mountain Peak which, at 7,402 feet, has one of the most spectacular views on the island. Available in both Medium Roast only.